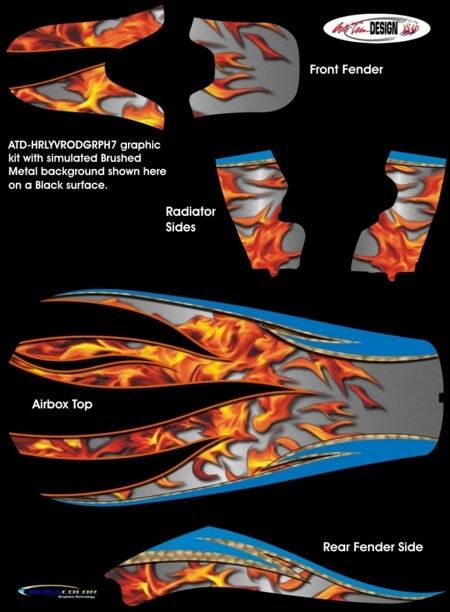 Change the whole look of your bike and turn heads with this unique seven (7) piece Flames Graphic Kit! Offered in two different color backgrounds, design elements of this kit include realistic flames and hand-brushed gold metal trim - all highlighted with Blue, Orange and Black outlines. While graphic kit is shown on a VRSCA/B, kits are available for Harley-Davidson V-Rod VRSCAW, VRSCD, VRSCDX and VRSCR models. This kit is a Half Wrap kit whereas the Rear Fender and Airbox pieces come precut with no trimming while the Front Fender and Radiator Side pieces require wrapping and trimming. Suggested Installation Time: 1.5 hours.